Signature Iron Doors created this beautiful Iron Gate. Our client wanted an open feeling along with security and wind protection. 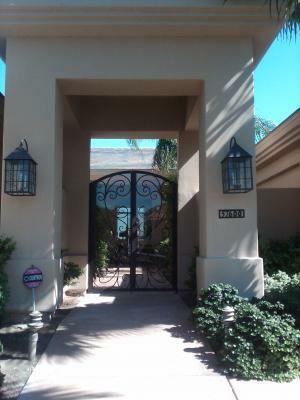 We designed this Wrought Iron Gate with glass so that all of their requests were satisfied. Let us design something for you today!! Please come visit our showroom (480-388-3535). We are the Phoenix Valleys premier choice for Iron Doors and Gates. Let us help you create a dramatic first impression out of Iron.